Just wanted to share one (among a few) of my other hobbies (photography in general really), as I took these last night. Got a new star tracker and wanted to see what I could get. Still not dialed in perfectly but I'm impressed with my first attempts. Keep in mind this is from the front/backyard here in Columbia, so not exactly dark skies. 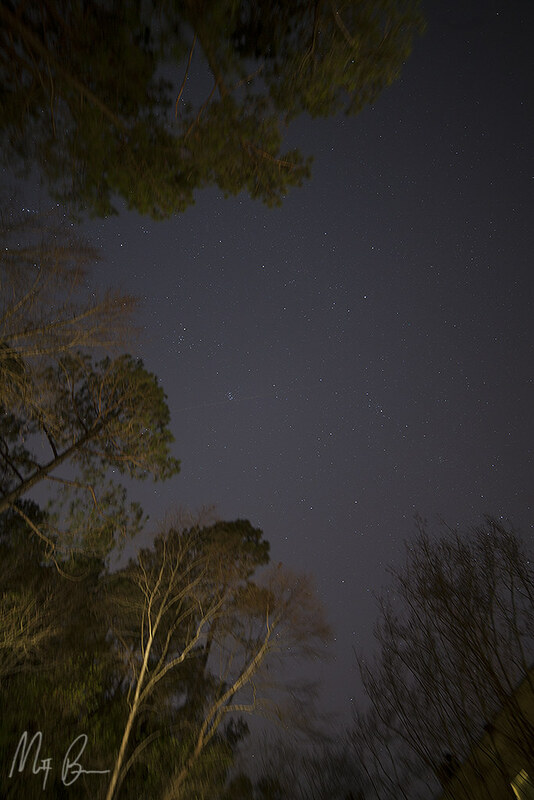 Here is just my first attempt to get anything, you can see the stars look still while the trees are blurry. In a normal picture it would be opposite as the heavens are moving but since I am tracking a single point in the sky everything else in the frame is moving. Airplane flying past. I missed the one meteor I saw last night sadly. 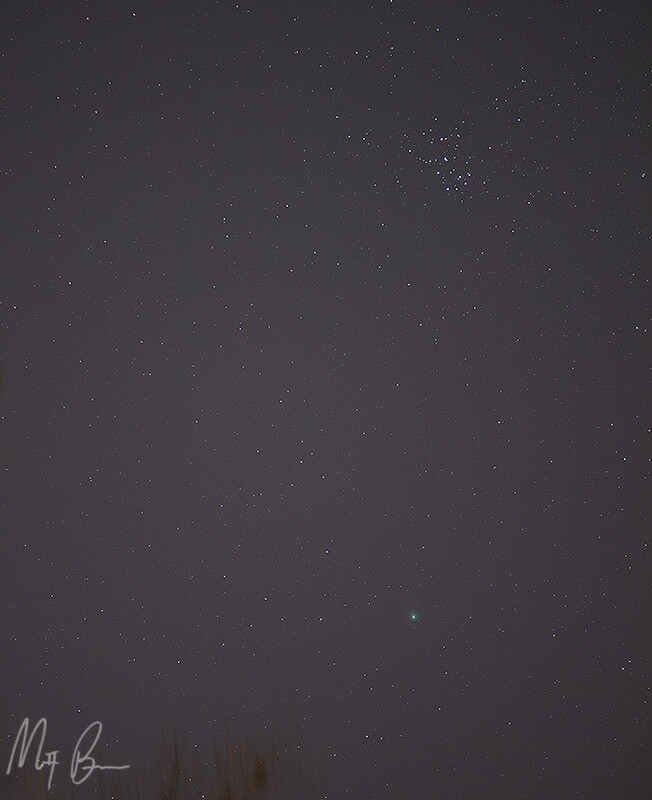 Here is the Hyades, directly below that is Comet Lovejoy! Yes its really that green! 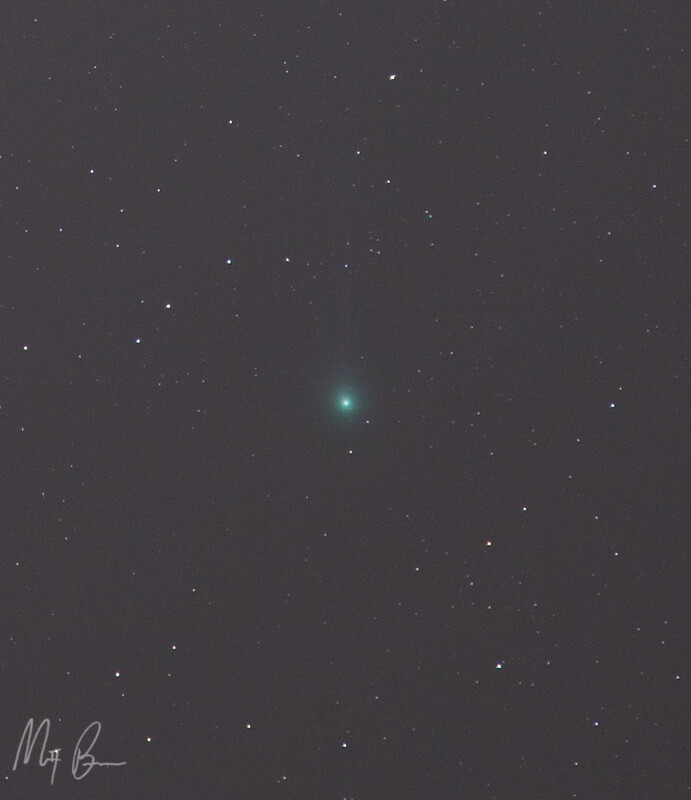 You can see the comet's tail extending directly above it faintly. Here is a cropped shot so you can see it a little better. Just a giant ball of glowing green ice flying through the sky. I was overly excited about those after I looked at them on the LCD screen, thrilled really. Was not expecting such great results. I could of been perfectly happy going inside out of the cold with those....but I didn't. A thought popped in my head, could I capture this other thing now that I had a tracker? Could I do it with my 105mm lens?? Well, might as well try. Try I did and I got probably the coolest thing I've ever captured since the Milky Way at the beach. Do you see it? 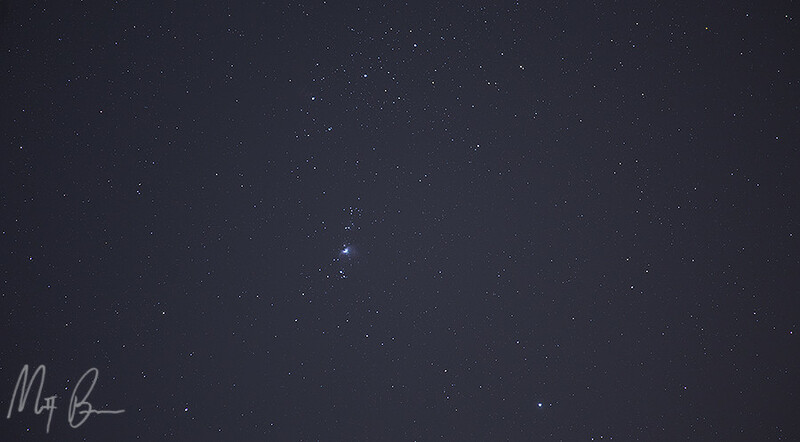 That's the lower half of Orion. But wait whats that....Got it! 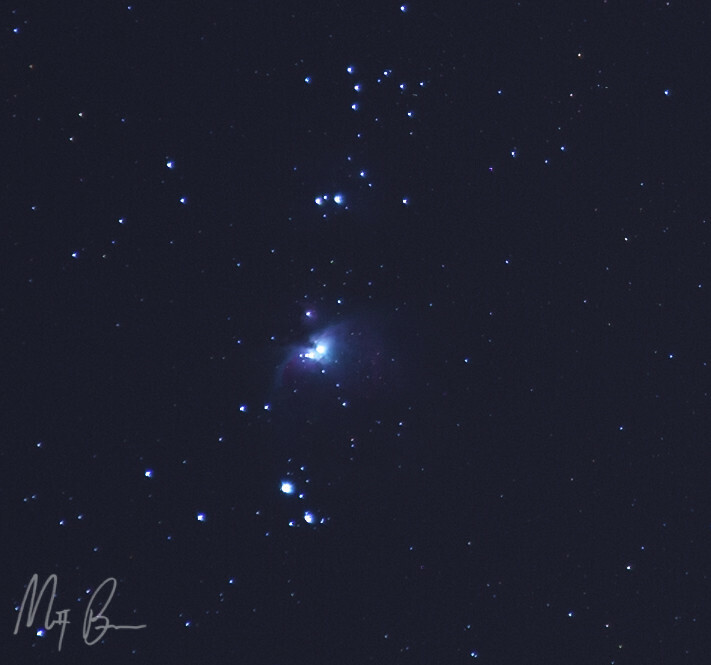 Orion Nebula or M42!! When I saw this I was just blown away, can't believe I got it with my 105mm. The colors are that real, even more actually If I had a better lens to pick them up. This just gave me a whole other love for astrophotography last night. Its amazing what you'll see if you turn out the lights and go outside. I'm jealous of those that live around dark skies too. Last edited by MattB; 01-19-2015 at 04:10 PM. WOW- that's some pretty sweet imagery! 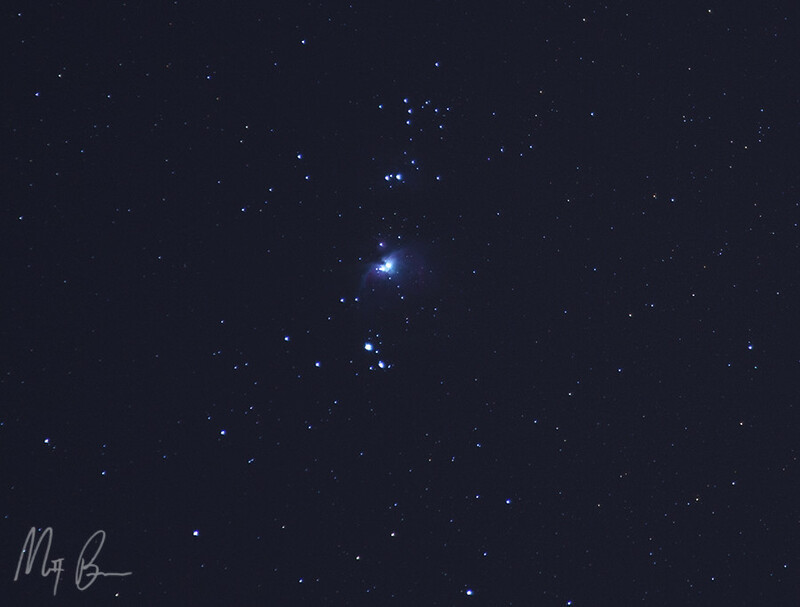 Pleiades is in the upper right corner of Orion isn't it? Thanks. Yes you are correct I believe Hyades is right above the comet not Pleiades. That's crazy. Love the pictures. Thanks for sharing. Awesome shots. I really enjoy star gazing too.